The central hall. Is that new carpet I see to the right? 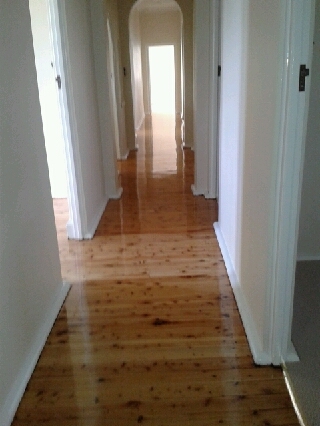 I was thrilled tonight to get photos from Michael from Mudgee Carpet Court who is looking after the floors. 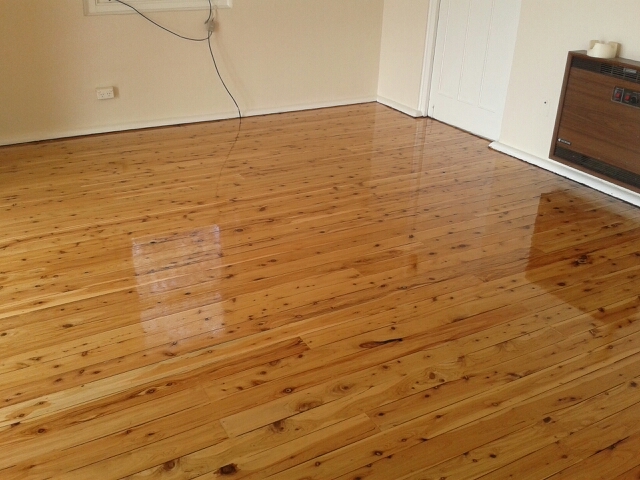 The boards are Cypress pine and every tells me they’re good quality and should come up well – but it’s hard to imagine what they’ll look like when I’ve only seen them covered in multiple layers of old carpet, masonite and lino. The lounge room looks great. And I now have some furniture to put in there. Anyway, I’m relieved and thrilled with the results shown in the photos and can’t wait to get up there and finally put some permanent furniture in place and set up rooms. Looks like this can start next week. I also have removalists booked in a few weeks from now to take some things up to make the Convent look a bit more homely and tidy up my place in Sydney. 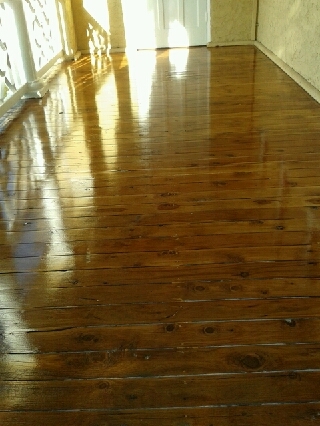 Hard to believe this is the old weathered verandah floor outside the Chapel. The old cane furniture should be great here. More auctions may be on the cards this weekend as it will be best for me to buy what I can prior to finally moving from Sydney. Removalist costs to Kandos do not come cheaply! Items I have my eye out for include smaller old wardrobes (often a good buy as most people have built-ins these days and you can pick up quality old pieces very reasonably), chests of drawers, study/library type chairs, perhaps a sideboard or credenza. Auctions are very opportunistic – you need to be well prepared, disciplined and bid fast – most items are only up for auction for less than a minute! I also think some floor rugs will be in order – and lots! This was the big surprise. No idea that the old green carpet covered the original parquetry flooring which I’ve been told is great quality and has come up beautifully. 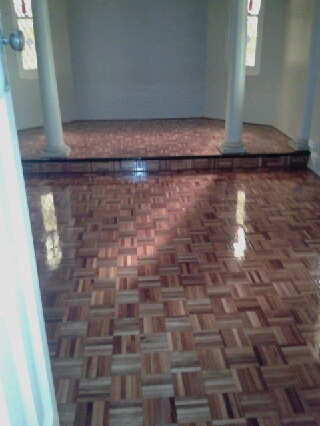 The floors look absolutely stunning. Can’t wait to see them in person. Thanks Ros. I can’t wait for everyone to come up and see it. It will be so different from what you remember. Margot how beautiful she is! The chapel floor is magnificent. She’s loving all the attention. I wonder if the nuns used to do a bit of a twirl on the floor when the sun went down. Thanks Maria. I’ll be keeping a lookout. I don’t want really big ones though, particularly for visitors. Some of the old wardrobes are enormous.